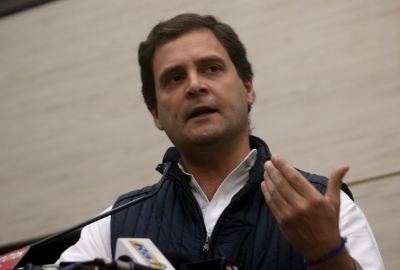 New Delhi Sep 15 (IANS) Congress President Rahul Gandhi on Saturday accused former CBI Joint Director A.K.Sharma who is also a former Gujarat IPS officer of helping fugitive businessman Vijay Mallya to escape from the country. He said Sharma who was in the CBI in 2015 was also "in charge of Nirav Modi and Mehul Choksi s escape plans". The Congress President also alleged that Sharma is Prime Minister Narendra Modi s "blue-eyed-boy" in the CBI. "CBI Joint Director A.K. Sharma weakened Mallya s "Look Out" notice allowing Mallya to escape. Mr Sharma a Gujarat cadre officer is the PM s blue-eyed-boy in the CBI. The same officer was in charge of Nirav Modi and Mehul Choksi s escape plans. Ooops...investigation!" Gandhi tweeted. Earlier this week he had accused Union Finance Minister Arun Jaitley of "colluding" with Mallya to help him flee the country and demanded his resignation. Gandhi had asked why had Jaitley not informed the investigative agencies about his meeting with the chief of now-defunct Kingfisher Airlines. Mallya who left India on March 2 2016 faces charges of defrauding banks to the tune of Rs 9 000 crore.